Join the discussion on our forums! Come discuss Big Bad Voodoo over in our dedicated Big Bad Voodoo discussion topic. With all of the purple on this card, I honestly thought this was a Warlock card. Boy, was I confused. fun from Hagatha, but I don#t see any practical implications. Even with Zentimo you'd first need something worth buffing. Sure, Double Corridor Creeper sounds neat, but a that point you could just as easily use Unstable Evolution. It's not useless, but it's too situational for a deck that values tempo. Edit: you could use this for shits and giggles in Snowfury Giant Overload Shaman instead of ancestral Spirit to resummon your snowfury giants as mountain giants. In fact, I'm gonna do just that, because memes. This is good by itself, and have some serious synergy with other spells and cube. If I have a big minion and have to trade this gives me a lot of value. So this is not a high-roll card like evolve, rather a value card, and it can work in almost any deck with big minions. How is this modified by spell power? This isn't Unexpected Results, nothing indicates spell damage affects it. no... the numbers brackets are just there to separate numbers that care about affecting mana costs. Examples, Snowfury Giant, Far Sight, Evolve. Nearly all cards that affect or care about mana cost, have those numbers in brackets, if shown. (with exception of cards that care about very specific costs). Again, look at Unexpected Results. It has to specifically say that it is affected by spell damage, since spell damage, well, would normally just affect the actual spell damage. This flavor is deeply upsetting. 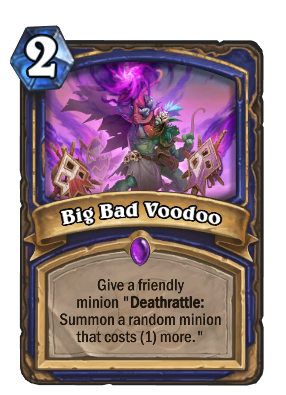 Because you know, there's Evolve, Devolve, Unstable Evolution, Master of Evolution and then there's Big Bad Voodoo. What's that got to do with anything? Shaman does run Corridor Creeper. He’s less likely to run Rabble Bouncer. Not a bad card, just not good enough right now. In standard, there will only be two 12 cost minions, so there is a 1 in 16 chance in this case (replacing Lesser Sapphire Spellstone with Greater Sapphire Spellstone cuz I'm sure that's what you meant) to get ALL Grave Horrors, and a 1 in 16 chance to get NO Grave Horrors. In other words there is a 15/16 chance to get AT LEAST one Grave Horror, so you'd have to be Kripp to not get any. The optimal strat obviously is to play 15 games with this deck and then never ever play it again. Well, now you can fully trade with something to have it evolve. At least other shaman epic is good. Step 1: Play Big Bad Voodoo on a Corridor Creeper. Step 2: Get a Hir'eek, the Bat from the deathrattle. useless, Ancestral Spirit is more reliable and just better and barely sees play , 400 dust for this is trash simply a bad and underwhelming card. I would play this, at least I would enjoy getting this off Hagatha for sure.